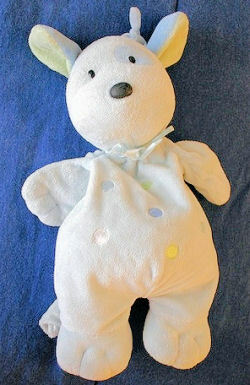 Hi, I am hoping that someone can help me find my 20 month old son’s ”bear”. It is actually a blue puppy musical crib toy made by “Just one year” by Carter’s. I bought it in late 05/06 at Target, and he’s had it since he was born. He still has one, and it’s in OK condition, but its musical pull handle broke off, and after being washed, it no longer plays music…which is what helps him sleep. The other problem is, there are TWO versions of this bear. One plays Brahms Lullaby, which is what we need (the other plays Rock a Bye Baby, I think). If anyone could help I would greatly appreciate it!!! If you can help Shannon find this Carter’s blue dog musical crib toy that plays Brahms’ Lullaby, THIS SITE IS NO LONGER ACTIVELY MANAGED. Please use Our FREE FACEBOOK GROUP, including #020708-5 in the subject, . Please be sure you use an email address that is correct, and that you will be using for a long time!! I can’t help you if I can’t contact you!! The carters blue dot bear is very similar and there are a lot more of them… she might look into that possiblity. I need to find that puppy too!!! There is one on eBay right now, but I don’t have a way of contacting Jennifer!!!! If you see this in time, search for 300208829985 on eBay! am looking for this same dog, btu the one that plays Rock a bye baby. It’s my 19 month old son’s lovey, He takes “Oggy” everywhere, after cleaning him for a year and a half he won’t play. There is one on eBay right now from a seller who promptly answered my question about what her dog played (Brahms), so if you need that one – here’s the link. Hi, my 3yr old boy just lost his blue puppy, and was wondering if any of you know of somebody who can have it. Have looked in ebay and amazon but not the extact one, thanks !! Pedro we can't help you unless you contact us!